Darren Bent. So what does he do exactly again? Quite a bit apparently. If you've not read part one, click here. I'm following up that article with, well to be honest, more of the same. One of the main arguments put forward in favour of Darren has been related to stats. He scores goals, so what else do we want from him? The counter-argument is that because of his lack of team-play quality (he doesn't hold up the ball well, support team mates, create or assist, not great at heading, woeful positioning) we only benefit from his goal-poaching when we play a certain type of formation or when away from home. He's therefore one dimensional according to those who believe he doesn't bring anything else of value to the side. He just feeds off the scraps. Instinctively, but not as busy as a Greaves or Lineker who both, arguably goal-hanged, although both were very much capable of scoring goals out of nothing. But even though Greaves could go 85 minutes without doing much, then bang in a couple of goals, comparing Bent to Jimmy is borderline ridiculous. Is it not? If one dimensional gets you a better goal ratio than a player who possesses more tricks in his locker, should we simply be playing to his 'strengths'? If your answer is yes, then what formation/team structure would we need to play? Perhaps kick random balls into the box and hope Bent gets on the end of some of them? 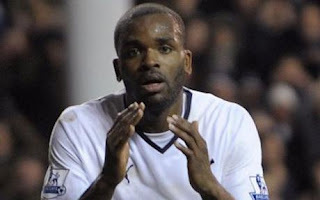 Tottenham's play will have to be basic to cater for Bent upfront. Basic in the sense that nine outfield players link-up and get involved in build up play, with Bent waiting in the shadows alone for a ball to roll within proximity to his feet. How many of the above were scraps/rebounds/plain lucky? How many were created after a sweeping move or out of absolutely nothing? How many saw Bent link-up with the midfield before sweeping forward to complete the move and bury the ball in the back of the net? Does it matter, as long as the end result is 'the ball hitting the back of the net'? He's scoring so that's surely enough, no? If Robbie Keane scores less goals than Darren Bent per games played, does that make him any less of a player? Of course not. So who would you prefer to have in your starting line-up? Bent's ratio is possibly even better than what Berbatov managed with us - but would you pick Bent over the departed Bulgarian if he was still here? Silly question, right? You wouldn't. So should you be asking 'why'? It's OK to refer to the statistics and ratios and state this as evidence enough for his inclusion, but a stat worth looking at perhaps is how many assists come from the feet of Defoe/Pav/Keane etc compared to those of Darren Bent. Note also that Cudicini has a habit of rolling the ball out to fullbacks when Pav isn't on the pitch, as Bent doesn't win headers. Personally, he should always roll the ball out. Prefer it when we play from the back, keeping the ball on the ground. At this moment in time - should we not be concerned with anything other than hitting the back of the net, no matter how? Where Bent fails to achieve the link-up work of a Keane or a Pav (who both assist the team into functioning cohesively) he produces the final goods - goals. And in our predicament, surely any scrapes or rebounds will do. Surely goal celebrations are more imperative to a sweeping move involving 5 or 6 players resulting with a forward waving his arms in the air screaming at the ref? Perhaps that's a simplistic way of looking at it. Bent is not a better footballer than Defoe or Keane. He won't get involved as much as either of them. He won't assist or create. We need to win games, no matter who does the scoring. And having a cohesive hard working Spurs team out on the pitch every week, players working for each other, will make a far greater impact than having a fragmented side with players who don't quite fit in. In a relegation scrap, we can't afford to miss any opportunity that presents itself in front of goal. Bent still has a part to play in the season. He' still important for certain scenarios. But he's not going to be here come the end of the summer time. Where Spurs will be by the start of August is also up to 11 players rather than just one. I guess, as ever, all we can do is support the players out on the pitch. Including Darren Bent. And I'll be celebrating one of his goals with the same loopy celebration that would accompany a Keane or Pav goal. If Darren continues to score goals in his limited appearances we won't be complaining. What does Darren Bent do exactly?